Saturday, April 27th Petaluma's annual Butter & Egg Days parade steps off at noon and marches through historic downtown in a festival of fun and activities from 10 a.m. to 5 p.m.
Clover Sonoma leads the Clover Kids’ Parade, which precedes the main parade at 11:30am with a procession of preschoolers and primary grade youngsters and their families. Join the Cutest Little Chick Contest! Petaluma Egg Farm is excited to host the 35th annual Cutest Little Chick in Town Contest. It's always such a treat to see all of the creative and cute costumes and those darling little people all decked out in yellow! Contest judging takes place in front of Copperfield’s Book Store on Kentucky St. Check in 9:45. The contest will start at 10:15. Friends of the Parade Button Discounts! Spend $5 and save by shopping locally! To get the discount you must be wearing your button! Buttons are available for purchase at the Petaluma Visitors Center, Lombardi's Deli, Raley's, Crown Hair Salon and Petaluma Market. If that's not enough fun for one weekend, don't miss the open air Petaluma Antique faire, downtown from 8 am to 4 pm. Spring hillsides are blooming and gardens are loving the sunshine after the long winter’s rains. McEvoy Ranch's Garden Manager, Patty Hawkley, makes the most of the bounty of the season by creating inviting wreaths placed around the Ranch. You can too! Join the team at McEvoy for this special spring wreath making workshop led by Francesca Perez of Francesca’s Flowers & Gardens in Santa Rosa. $150.00 Click here to register. In honor of Moms everywhere McEvoy Ranch is setting aside normal tours and tastings for the day to celebrate moms with a special patio party. What better way to celebrate Mom than surrounded by the beauty of an organic olive oil ranch and vineyard? Tear your Mom to this special Patio Party and enjoy a buffet of ranch nibbles, tickets for four wine tastings, live music, special sale prices on oil & natural beauty products and optional tours throughout the day. What a great way to celebrate, relax and soak up the sunshine and views. $60.00 Click here to register. RSVP is required to receive event map. Click here to join the fun ! For the Arts: Molly Best "The Art of Managing an Arts Center"
For Life; Timo Rivetti "The Art of Real Estate"
Molly Best is thrilled to be surrounded by the talent that fills the Art Center. She is now the PAC’s operational manager and has been busy getting up to speed over the last couple weeks. Having grown up in Petaluma and now raising her children here, she is very invested in helping her local community grow creatively. She is an artist, a baker and in a past life, a butcher. You may recognize her from her days at the Tea Room Cafe or Thistle Meats. She is no stranger to Petaluma and PAC is proud to welcome her as the newest member of its team. 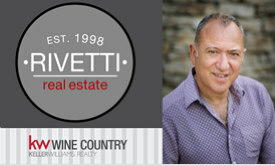 Timo Rivetti is a passionate practitioner in the art of real estate in Sonoma County. He enjoyed a diverse career background in his native UK and California prior to earning his reputation as a skilled Petaluma-based property negotiator and dealmaker. Timo credits his propensity for creative thinking and out-of-the-box ideas and solutions as the common thread that ties together his rich and varied past career experiences to his ongoing success as one of the region's consistently top performing real estate brokers. Born to Italian immigrant parents in Peterborough, UK, Timo left home at 16, attending Eastbourne Art College with a focus on photography in his late teens. This led to an introduction to the vibrant art and music scene in Brighton, England. Timo managed bands in his 20s, the most successful of which, Curiosity Killed the Cat, rose to number one in the British music charts. Timo brokered a deal in which he and the band worked with Andy Warhol at The Factory in New York, producing a music video. Numerous start-up opportunities followed on both sides of the Atlantic, with a brief move into the advertising industry bringing him to San Francisco in 1990. Timo tried his hand in various internet companies prior to the birth of his third son in 1998, the year he took the plunge and studied for his real estate license. After being in the business for over two decades, Timo has built a wide network of community connections and is focusing much of his attention on working with others in visualizing how to broker deals that better life in Petaluma for all. A long time soccer coach and hobby winemaker, Timo was a founding member of the Petaluma Gap Winemakers Association. He is married to Southern Sonoma Country Life editor & freelance writer/author, Frances Rivetti. Timo and Frances raised their three sons in the area. Established in 2016, the Idea Lounge is an exciting series of talks with a twist! Two speakers: one from the arts, one not. The audience uncovers what they have in common, revealing connections between art & life. The Idea Lounge is part of PAC Out of the Box, a series featuring collaborative activities that take place literally and figuratively outside the walls of the Arts Center and outside the typical art exhibition. Now in its 5th season, the Idea Lounge has featured speakers of all paths of life, presenting on a variety of topics. The Idea Lounge is produced by Petaluma Arts Center. Interested in speaking at a future event? CaminoWays.com, the Camino experts, have launched a wonderful new North West Spanish Camino route available for pilgrims in 2019: the Sea of Arousa Camino walk and boat, also known as Camino Espiritual. I have friends who have walked all or parts of the trail and several who are planning their own pilgrim walks. This new route will no doubt lighten the load of international pilgrims on this increasingly popular bucket list activity, walking and weaving through beautiful coastal landscapes, villages and ancient monasteries from March through November. The Sea of Arousa Camino trail was recently approved by Santiago Cathedral as an official Camino de Santiago route. The trail takes pilgrims through quaint coastal villages, lush forest tracks, vineyards, sandy beaches and ancient monasteries following an alternative route to the classic Camino Portugues. This fascinating Camino trail is also known as Camino Espiritual as this unique Camino includes a boat trip across Arousa Estuary retracing the route taken by the body of St James on its way to Santiago. A short break on the Sea of Arousa Camino Espiritual from Pontevedra can be walked in just 4 days but if you'd like to receive your Compostela certificate it's recommend that you start your walk from Vigo or Baiona to walk at least 100kms into Santiago. An 8-night self-guided tour from Baiona to Santiago starts from around $850 per person sharing; including 8 nights' accommodation with breakfast, boat ticket, luggage transfers, holiday pack with route information, 24/7 assistance number. Dinners, airport transfers and hotel upgrades are also available. Flights, lunch and insurance not included. Discover more of the amazing bounty offered by land and sea as Sonoma County celebrates Earth Day this year with events, festivals, volunteer opportunities, or by simply getting outdoors and breathing in the glorious spring air. There's so much to do and see here that Earth Day — Monday, April 22nd — is more like Earth Month. Start a week early with a events at Quarryhill Botanical Gardens, Alexander Valley Vineyards, Windsor Earth Day and Wellness Festival, or a tour at Safari West. Near the actual day, there are opportunities to volunteer for a beach cleanup or take in an art exhibit that showcases climate change. Celebrate the weekend after and experience Earth Day on stage, an annual family friendly festival in Santa Rosa. Earth Day is a time to connect with the land and with each other in the great outdoors that we're so thankful for – all 1,576 square miles of it. More than 60 regional and state parks make Sonoma County one of California's most diverse natural destinations. Hike among towering redwoods; watch for whales, otters, or sea lions along rugged Pacific coastline; paddle through the inviting cool waters of one of three rivers, and get to know neighboring small towns. Find more outdoor activities at www.sonomacounty.com/outdoor-activities. The peacefulness of the Quarryhill Botanical Garden that stretches over 25 acres — home to more than 25,000 rare and endangered plants — provides the ideal setting for celebrating the many ways we can conserve and protect our planet. Celebrate Earth Month at Alexander Valley Vineyards with a special tour hosted by owner Harry Wetzel, IV, focusing on the decades of sustainability at AVV. The 1.5-hour tour will look at the environmental, economic, and social elements of sustainability that have been implemented since 1962 at Alexander Valley Vineyards. This earth-friendly and health-friendly event on Windsor Town Green features entertainment for all. Pick up spring produce and food at the Windsor Farmers Market. There will be children's games, activities, and crafts, health and wellness booths, and more! Have an Earth Day adventure at Safari West! Once a year, the whole world comes together to celebrate the wildlife and wild places that make the planet wonderful. This Earth Day, Safari West is inviting a bunch of friends to help make the Sonoma Serengeti that much more special. Discover amazing organizations fighting to conserve species the world over! And of course, enjoy a safari adventure all your own. Join Stewards of the Coast and Redwoods and Partners for their annual Earth Day Clean Up of North Jenner Beach and the Lower Russian River in Jenner, which is part of Sonoma Coast State Park. Come join the Steward Ship, partners and communities to clean up the river and beach, by sand and kayak. 9 a.m. to 12 p.m.
Healdsburg Center for the Arts presents the exhibit Reflectivity - Artists on Climate Change, April 20 - June 2. In addition to the opening reception on April 20, Reflectivity will feature the Four Elements Festival, a one day street festival and celebration of Earth Day. The Four Elements Festival will be on Plaza Street from 1-5 p.m. with art activities for kids, Sonoma State's Center for Environmental Inquiry, Symmetry Arts tree stilt walkers, guest speakers, and live music. Santa Rosa's 10th Annual Earth Day Festival is a free, family-friendly festival that brings the community together through fun activities, live performing arts, and inspiring exhibits that raise environmental awareness. Don't miss out on this opportunity to celebrate the Earth with great people, local food, beer and wine. Join me amongst the blooms and greenery at beautiful Flower Casita (formerly known as Second Street Flowers) in Petaluma's Theatre Square for conversation and an exclusive evening preview reading from the first chapter of my debut novel, Big Green Country, an impeccably-researched, fact-to-fiction narrative placing women at the center of the cannabis story. Former San Francisco career tech worker, Maggie puts aside her own close-to-crippling mid-life problems when she takes to the road in an unexpected journey behind the Redwood Curtain in search of her missing 18-year-old niece, Mia and Jazmin, the teenager's undocumented best friend. The two have been missing in the remote forest land of the Emerald Triangle during the winter months following the teens' first harvest season as cannabis trimmers. Maggie and her rapidly assembled crew of would-be rescuers leave coastal Sonoma County on what proves a catastrophic road trip along the storm-bashed Russian River and through the Redwood Curtain in search of the missing trimmigrants. Be amongst the first to be introduced to the story behind Big Green Country, which is still in manuscript form. Please join us for this informal gathering at 6.30 pm, prompt, on Thursday, March 28th, 2019. California’s premier cheese event, the California Artisan Cheese Festival, to be held March 23-24, 2019, at various locations in Northern California, brings together cheese enthusiasts for a weekend filled with cheese tastings, pairings, tours, seminars, a culinary competition, and cocktail and wine tastings. While the festival’s larger events like Cheese, Bites, & Booze! (where guests can nosh on tasty bites created by cheesemakers, chefs and cheesemongers’ and sip on regional artisan wines, ciders and spirits) and The Marketplace (where attendees are invited to taste, discover and purchase specialty items from over 100 artisan producers) are sure to appeal, it's the smaller events like the festival's Farm & Producer Tours and Seminars that provide festival goers intimate, immersive experiences with some of the most reputable and knowledgeable experts in the industry. Join the debate as to whether red or white wine is a better match for cheese with Planet Cheese publisher and educator extraordinaire, Janet Fletcher. Attendees will sample five cheeses alongside both a red and white wine while Janet shares some sensory research into wine and cheese pairings. California has a rich and dynamic history of cheesemaking. Juliana Uruburu leads guests on a tasting journey illuminating the connections between the Golden State’s storied old school and new school cheesemakers. Unique beers and ciders are the pairing of choice for many cheesemongers as an alternative to wine. Rachel Perez guides attendees on a tasting journey demystifying the characteristics that make beer and cider so cheese-friendly. Guests will leave this session with a solid foundation of pairing principles and several foolproof beer, cider, and cheese pairings to try at home. Having made cheese on more than a dozen dairy farms across Europe with some of the finest affineurs (professional cheese agers), Cheese Twins Charlie and Michael Kalish bring their savoir-faire home to California. This comparative tasting gives guests a crash course in the science behind cheesemaking and highlight how seemingly subtle shifts in pH, moisture, and aging result in staggeringly different cheeses. Cheese mavens Vanessa Chang and Lassa Skinner demonstrate how a well-made cocktail can shake up preconceived notions of what goes with cheese. This dynamic duo will distill the basics of the various spirits, demystify the universe of bitters, and help identify cheeses to round out cocktails like Manhattans, Mai Tais. 9:15 a.m. – 3:45 p.m.
Attendees of this tour will spend a day at Giacomini Dairy to discover what makes Point Reyes so special. Visitors start their day with a tour of the farm, meet the cows and learn about the farm’s history. Following the tour, guests head to The Fork, Point Reyes Farmstead’s education and culinary center for a focused cheese tasting and end the day with a three-course lunch and cooking demo with Chef Matthew Accarrino of San Francisco’s Michelin-starred restaurant, SPQR. 10:45 a.m. – 2:45 p.m.
Start your day with a guided walking tour at Pennyroyal creamery and vineyard to learn more about the integrative farming methods behind Pennyroyal’s handcrafted cheese and wine. Following the tour, enjoy a seasonal multi-course lunch prepared from the bounty of the kitchen garden as well as farmstead meat and cheese. Pennyroyal Farm cheesemaker Erika McKenzie-Chapter and It’s Not You, It’s Brie Author and Educator Kirstin Jackson will lead a delicious and instructive seminar that poses the question, “If it grows together, does it go together?” while leading a tasting that explores the cheeses, wine, beer, and cider of the Anderson Valley. This tour explores the North Sacramento Valley cheesescape beginning with a tour of Pedrozo Dairy and Cheese Company, to meet Tim Pedrozo, a third-generation dairy farmer and self-proclaimed “accidental cheesemaker.” After Pedrozo, the tour will head to Orland Farmstead Creamery, followed by lunch and a talk with Rumiano Cheese Company, California’s oldest family-owned cheese company. Tour D: Hop to It! The Santa Rosa area is home to an amazing community of talented brewers and delicious beers. This all-day tour starts at Russian River Brewing Co., crafters of legendary Pliny the Elder, with a cheese pairing from Beehive Cheese Co., followed by a stop at the Barrel Brothers Brewing Co. to taste hops and malts alongside chocolates by neighboring Volo Chocolates. Seismic Brewing Co. is the next stop on the tour to taste brews paired with cheese from a local cheesemaker and concludes with a visit to Old Possum Brewing Co., one of Santa Rosa’s newest breweries. 8:30 a.m. – 3:45 p.m. This tour travels west of Petaluma to Toluma Farms, home to a herd of goats, a flock of sheep, and Tomales Farmstead Creamery. Guests will have the opportunity to tour the organic pastures, meet the goats and sheep, taste an array of cheeses, and enjoy an incredible brunch spread from Daily Driver SF, California’s newest creamery. The tour will continue with a stop at AppleGarden Farm to meet owner Jan Lee, learn about cider apples, and taste the fruits of their labor. The day concludes at Marin French Cheese, the country’s oldest continuously operating cheese company to taste their signature cheeses, including Brie and Camembert. This tour begins at Cowgirl Creamery in Point Reyes Station where attendees will taste their way through a flight of Cowgirl Creamery and witness a curd-making demonstration before heading over the hill to DeBernardi Dairy, home to Two Rock Valley Goat Cheese. Attendees will stop for lunch before heading to Achadinha Cheese Company where Jim and Donna Pacheco, with help from their four children, milk goats and make cheese inspired by their family legacy and the Old World traditions of Portugal. Start the morning off at Wm. Cofield Cheesemakers, one of California’s newest creameries known for its fresh cheese curds, clothbound cheddar, and Stilton-esque blue cheese. Next, attendees will visit Bohemian Creamery and meet Lisa Gottreich, one of the region’s most creative artisan cheesemakers, followed by a stop at The Barlow where Chef Duskie Estes, a regular guest on the Food Network and self-professed cheese lover, will prepare a delicious multi-course lunch inspired by cheese and locally-sourced ingredients. The tour will conclude with a visit to Spirit Works Distillery for a guided tasting though its local spirits alongside pairings from Cypress Grove Cheese. Rise and shine at Nicasio Valley Cheese Company, California’s only organic farmstead creamery with a tour and tasting of its award-winning cheeses followed by a visit to Marin French Cheese, the country’s oldest continuously operating cheese company, which will celebrate its 154-year anniversary in 2019. Guests will continue on to Valley Ford Cheese & Creamery to enjoy a delicious cheese-focused lunch, tour and tasting of Valley Ford cheeses, crafted with milk from the family’s nearby herd of Jersey cows. Attendees start their morning outside Petaluma at the Pacheco Family Dairy for a tour of the farm while learning why the Pachecos transitioned from a traditional cow dairy to a goat dairy; complete with a tasting of the farmstead cheeses. Next, the tour will head to Nicasio Valley Cheese Company, California’s only organic farmstead creamery, to taste its award-winning cheeses that capture both the essence of this 1,150-acre family ranch and the legacy of the family’s Swiss-Italian heritage. Guests will stop along the way for lunch before heading to Lagunitas Brewing Company just in time for happy hour to taste a selection of their innovative local brews paired with cheeses from Sierra Nevada Cheese Company. ***Note: Bus transportation is provided by Pure Luxury Transportation for all tours except Tour B and Tour C (Tour B does not include transportation, Tour C transportation is provided by North Valley Shuttle.) Start and end times and tour departure pick-up and drop-off locations vary. All sales are final, and events takes place rain or shine. A more detailed list of the tour descriptions can be found at https://www.artisancheesefestival.com/tours. Following the educational seminars and tours, guests can opt to end their day participating in Cheese, Bites & Booze!, Saturday night’s grand tasting event held inside the Jackson Family Wines Aircraft Hangar at Sonoma Jet Center. This delicious competition features cheesemakers, chefs and cheesemongers’ creating their “best bites” of California artisan cheesy goodness. Guests sample the amazing creations while sipping on regional artisan wines, ciders, spirits, and beers at this light-hearted walk-around tasting event. Tickets for Cheese, Bites & Booze! are $80 per person (21 and over only, no children will be admitted). Sixty plein air paintings of each of the U. S. National Parks are the product of an extraordinary 72,000 mile, 3 ½ year journey by Sonoma County artist and gallery owner Mary Fassbinder and the centerpiece of an exhibition at the Petaluma Arts Center opening late January, 2019. “The National Parks Painting Project by Mary Fassbinder & Guest Artist Davis Perkins” exhibition will run from January 29th through March 23rd, with the public opening scheduled for Saturday, January 26th, 2019 at 5:00pm. Joining Mary at the Petaluma Arts Center will be Davis Perkins, a California landscape painter with an exhibition featuring his landscape paintings from around the world. Dave Perkins, who has had an exciting career as smokejumper, firefighter, and paramedic, received a degree in Fine Arts from the University of Oregon. In 2015 he was selected as a Signature Member of the Oil Painters of America. He exhibits his work in galleries and other art venues in Northern California, while continuing his life of travel and public service.